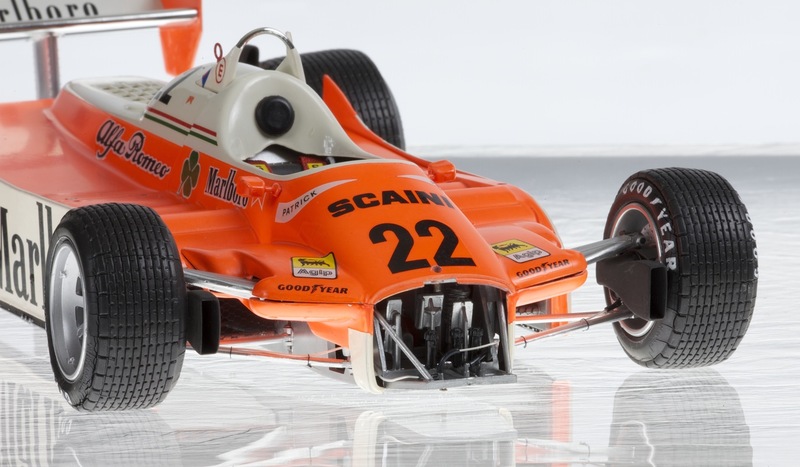 This model built in 1994, represents that driven by Patrick Depailler in the 1980 Grand Prix season without great success, however with some promise and improving grid positions culminating in a pole position for Bruno Giacomelli in the U.S GP that year. However the car retired from the lead with electrical problems epitomising the season-long experience of car-failure retirements and accidents, with only three finishes for Giacomelli and none for Depailler. 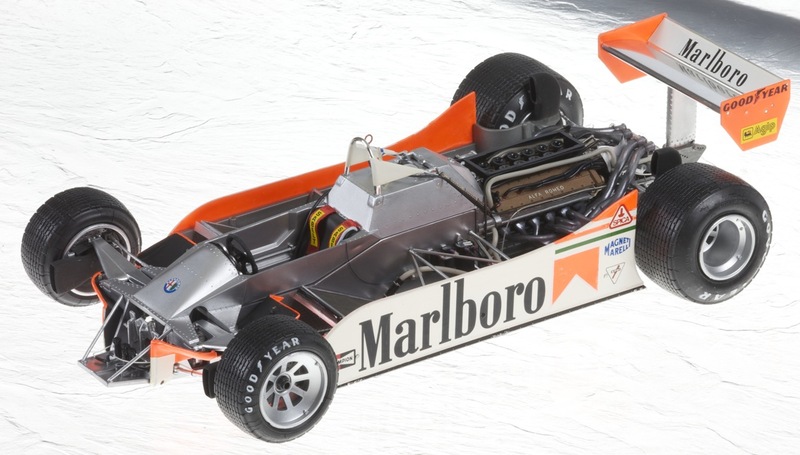 This very good looking car with dihedral front wings was a typical ground-effects GP car, though being a twelve cylinder normally aspirated engined car was not the lightest competitor. Such cars with skirts, suffered from skirt failure occasionally, most notably it is understood at the pre-race testing session at Hockenheim on August 1st when Patrick Depailler very sadly died after the car left the tract at the Ostcurve colliding with the barriers without restraint, for the catch-fencing remained rolled-up behind the barrier for the Grand Prix due to be run the following week. This incident highlighted the danger of relying on sliding-skirts to maintain artificially high speeds during cornering – these were banned in the following year with a compromise fixed skirt rule (60mm above the track surface) to reduce the potentially fatal reliance on maintaining ground-effect. Also, safety in terms of track-preparedness and suitability (marshalls, rescue vehicles including helicopter on stand-by) were becoming increasingly focussed on. 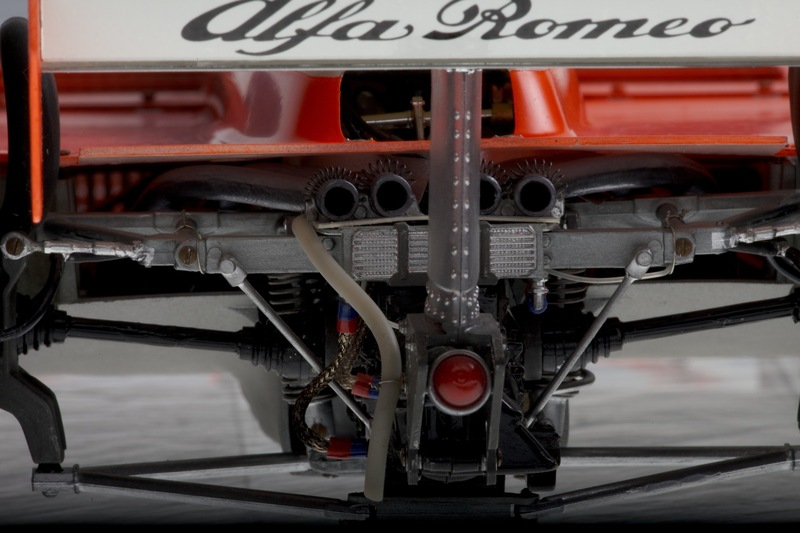 The Alfa 179 additionally shows how vulnerable the driver was sitting ahead of both engine and fuel tank concentrated line-astern centrally which pushed the driver forwards with feet ahead of the front axle-line and this was in the pre-composite era where cars had little protection to offer whilst using a traditional aluminium monocoque structure. 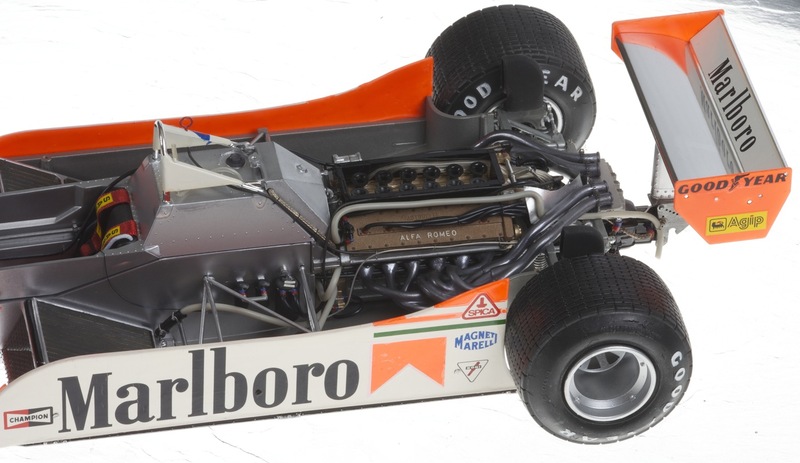 In later years, the shorter engines and less centrally concentrated fuel tank, meant that the front axle line became a defining point behind which to keep the drivers feet. 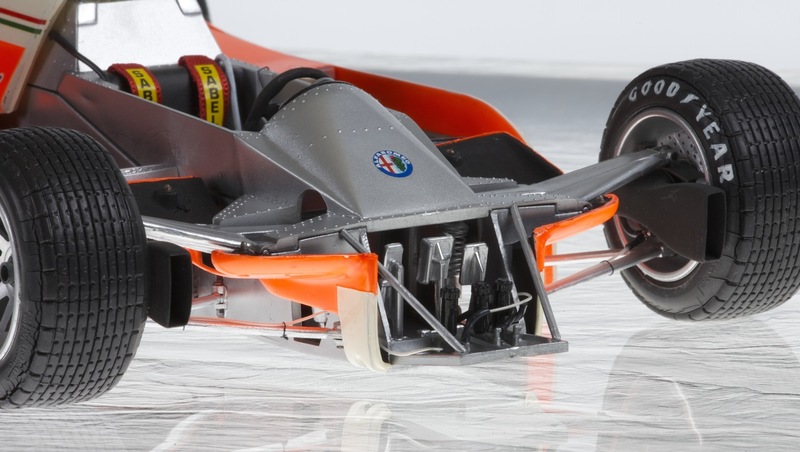 Increasing chassis strength derived ultimately from carbon-fibre composites technology, initially evolved through a period of experimentation with other materials such as aluminium honeycomb sandwich, Kevlar, carbon-fibre panels combined with aluminium etc. The model produced by Protar is potentially stunning. The kit as supplied, is simpler, less well produced by Protar than Tamiya would usually do, however the beauty of Protar is the alternative subjects on offer. 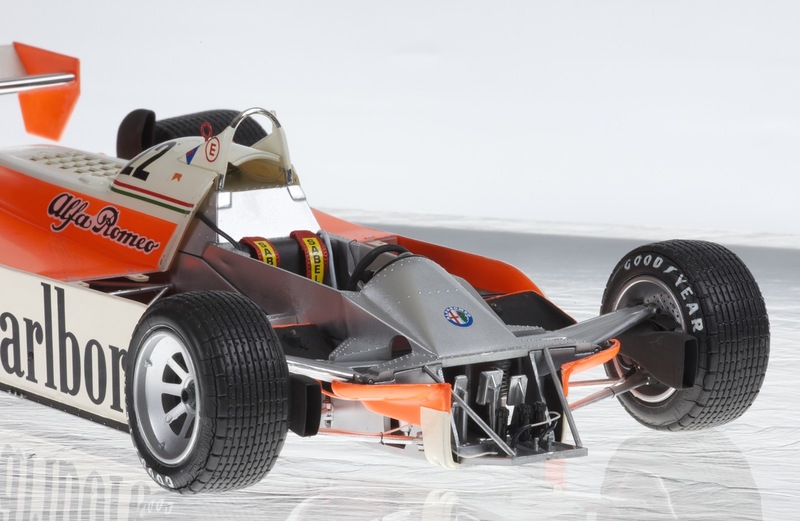 The tyres on this model are in the style of wet-weather rubber and are quite good, however a set of dry tyres would perhaps look better, especially if they were as good as that offered by Tamiya (a project for the future perhaps). Age has affected the tyres unfortunately and the tyre walls are showing signs of cracking, which is a pity. The model was supplied with clear top body sections which was novel, however seeking realism, this concept never interested me. 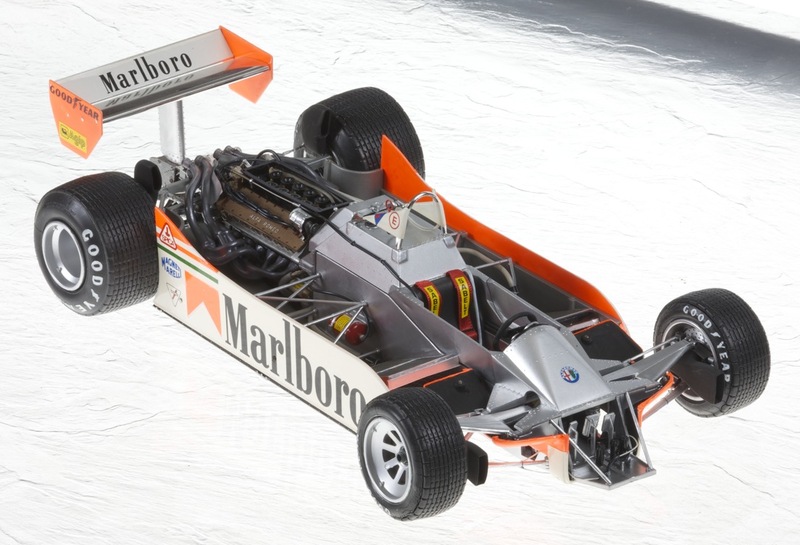 Since then, at least one Tamiya offering has featured the same innovation (McLaren MP4/6, I believe). At the time, although still quite dependent on enamel paints using a paintbrush, trying a basic airbrush was new to me and improved the outcome considerably, except that my choice of paint and approach didn’t meet with success on the top bodywork. No matter, I have a second set of decals with which I can enhance the model after a more professional effort at re-spraying someday. 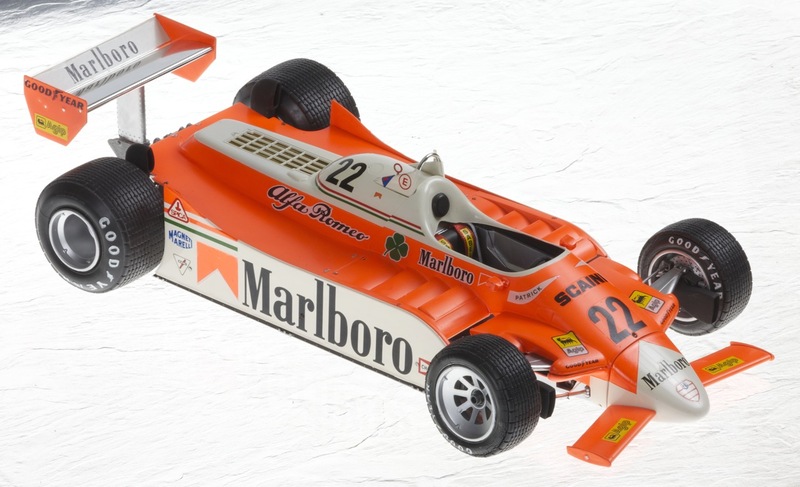 Speaking of decals, these were supplied originally including that of the cigarette sponsors, key to the overall image of the car in my opinion. 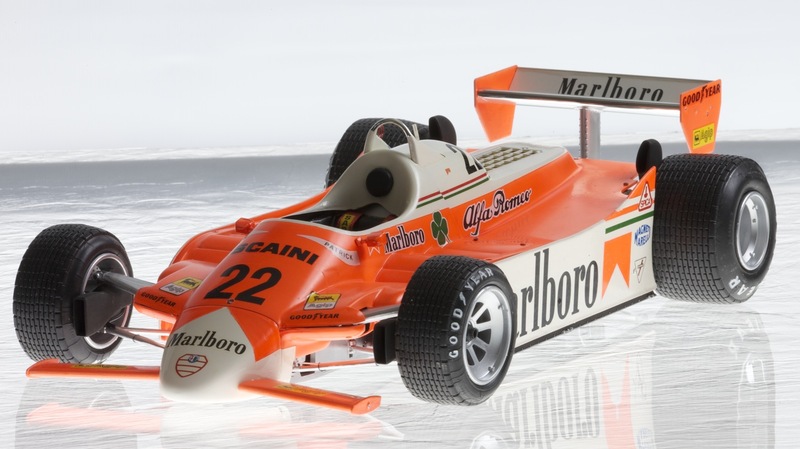 Re-issues of the model have had to comply with updated regulations and the Marlboro decals have been replaced with the standard vertical bars alternative, as raced in Britain and Germany in 1980, for instance. I enhanced/added detail to parts of the engine and interior based on that which I observed within the pages of that fantastic 1980’s monthly magazine, Grand Prix International. Apart from that, the model was built carefully and quite well from the box without any other modifications or alternative materials to replace plastic parts (a future project should the model be upgraded perhaps). It is notable that the body-sections appear not to line-up by merit of the decal placement, due I suspect to placing of decals on the two body-sections independently when they were later screwed down onto their support tabs changing their reference levels. Again, this could be improved upon, at a alter re-build. However, in my defence, I note with wry fondness that on every picture of the car in period, the same ‘fault’ was present, often more dramatically. Perhaps back in 1994 when I built the model, perhaps I had observed this and was allowing this to happen, I can’t honestly remember – a dilema should a rebuild take place. 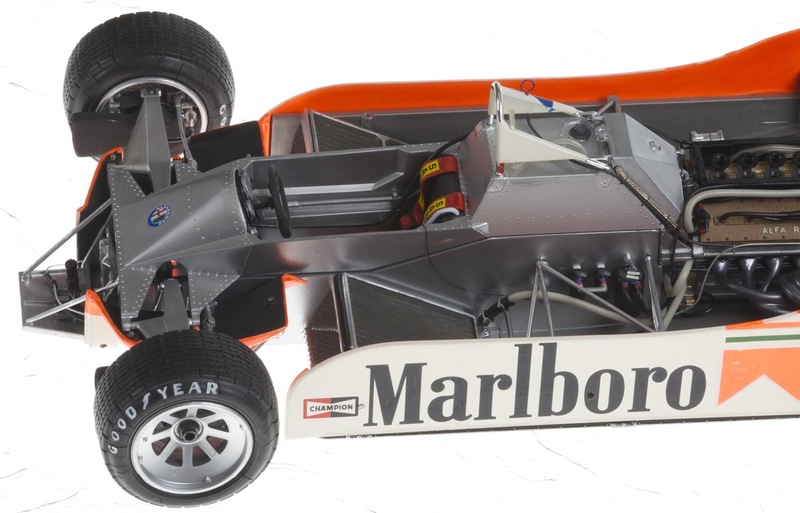 Having been at tyre tests at Brands Hatch in 1980, it was notable how poor the team was, arriving in a very second-hand and inappropriate transporter, the cars having quite a lot of orange tape along body-section joints and altogether looking both stunning in colour-scheme, yet decidedly second-rate in the finer details of presentation. The most memorable recollection of that day as far as Alfa Romeo was concerned, was the image of Patrick Depailler sitting on the handlebars of a push-bike pedalling his way backwards up and down the pit-lane during the lunch hour, whilst nearby the McLaren mechanics played football/similar game in the otherwise deserted narrow-confines of the pit-lane. I and a school-friend were fortunate to be in the covered stands opposite the pits and because there was no pits-access for the likes of us, had a grand oversight of the start/finish line and pits beyond. Very sadly, within weeks Patrick was tragically killed at Hockenheim during testing for the forthcoming German Grand Prix – one of those times you can remember where you were, what you were doing and what the weather was like, ‘moments’ as the news came over the radio that Friday lunchtime. The model is in many ways in celebration of Patrick, his adventurous life and the courageously tenacious Alfa Romeo effort during 1980. 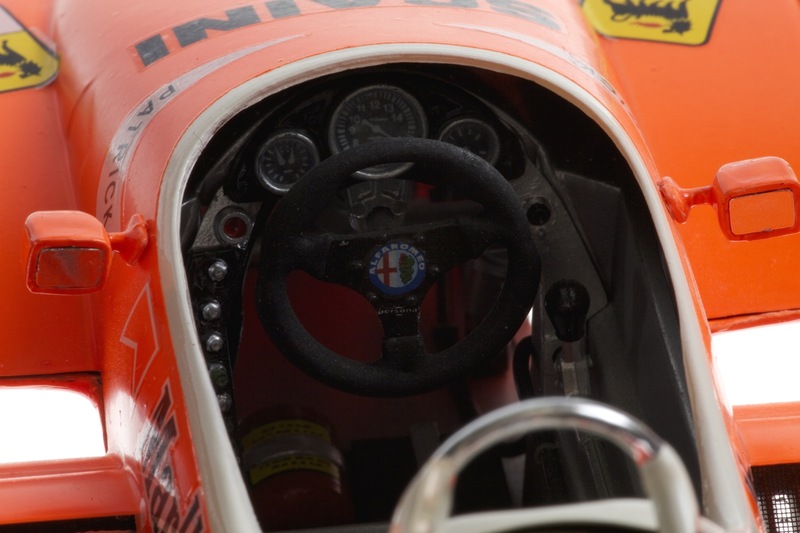 This view was enhanced by Bruno Giacomelli who as surviving teammate and almost the victor of the 1980 U.S. Grand Prix, signed a plaque for the model some years ago when I came across him at the Goodwood Festival of Speed. ‘Is it for sale?’ he asked during an otherwise relaxed discussion about old times; ‘sorry’ I had to reply whilst he enjoyed a selection of high quality prints of the model. At least he got to drive the real car that day, as prepared by Terry Hoyle a great enthusiast and generous supporter of younger enthusiasm such as mine.